The acceleration in the expansion of the universe was shown in 1998 by two international teams, the Supernova Cosmology Project, led by Saul Perlmutter, and the High-Z supernovae search team, led by Adam Riess. Whereas the Big Bang theory predicted a deceleration in the speed of expansion of the universe, their study of the history of the expansion of the universe using supernovae SN Ia over several billion years showed that it had on the contrary been accelerating for several billion years. This expansion only shows at a scale greater than that of galaxy clusters. Neither the Solar System nor the Milky Way are affected by the expansion of the universe predicted by the general theory of relativity. The simplest interpretation of the acceleration in the expansion involves a form of energy known asdark energy. The nature of it is unknown and, depending on the theories used to explain it the destiny of the universe will not be the same. 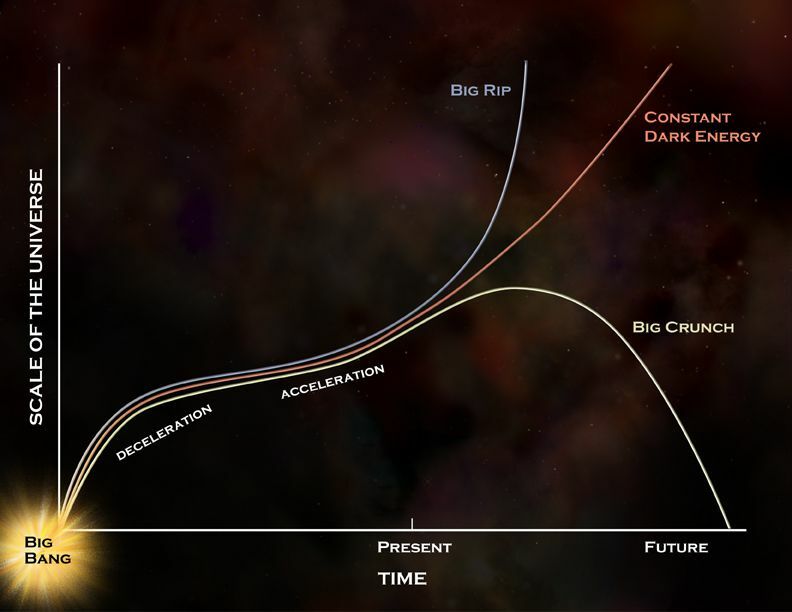 It may finish with a Big Crunch, a Big Rip or continue eternally accelerating expansion.